When she says of linguistics that it is “very easy to make it relatable to your life,” she speaks from personal as well as scholarly experience. 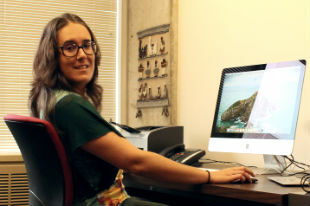 Since arriving at SIU, one of the ways Rodriguez- Ordóñez has made linguistics relevant to everyday life for her students has been to ask, “How is language gendered?” In a core course she teaches called “Gender, Language and Power,” she explores gender as an artifact of culture, starting from the notion that gender is something we learn. She recently asked her students to record a 30-minute conversation with someone they knew and trusted, with the aim of students performing a self-study. Says Rodriguez-Ordóñez, “The exercise points back—what does it say about us? Not so much about the other.” Many students were surprised to discover they employed “up talk,” for instance, the tendency to pitch the end of a sentence up, “Valley Girl” style. Nothing is more thrilling for a linguist than to find that one has entered a contact or boundary zone, like Southern Illinois, where northern and southern dialects get shifted. Rodriguez-Ordóñez arrived to Carbondale on July 27 and has been picking up on area norms ever since. She also enjoys sharing the “Pin-Pen Merger” with her students, a dialectic marker common to the South. It is, she says, a fairly reliable “sorting hat” to use with her Illinois students, enabling her to predict accurately whether each is from the northern or southern half of the state. Current research includes a study with a colleague of the Pilsen neighborhood in Chicago, which involves photographing and analyzing the signs in the streets of a neighborhood in which the majority of the people are of Mexican origin, with some Salvadoran and other Latin American immigrants also represented. It’s a small neighborhood—walkable—so it is fairly easy to categorize the signs: English? Spanish? Mixture of both? A central question the research is addressing is how economic displacement—as a result of gentrification— is registered in the signage. In the future, she hopes to compare Pilsen to the Mission neighborhood in San Francisco, evaluating the differences and similarities in the gentrification processes in these two communities. Dr. Rodriguez-Ordóñez loves to cook, hike, and dreams of having the opportunity to teach a course on the Basque language at SIU. An “isolate” language, Basque predates the Romance languages and is considered endangered—though not to the extent of many Native American languages, for example. Enjoying a cross-appointment in the Department of Linguistics (her tenure home) and the Department of Languages, Cultures and International Trade, Dr. Rodriguez-Ordóñez is a prized hire. We’re really fortunate that a daughter of the western Pyrenees found her way to the Shawnee foothills. Be sure to welcome her!